California was nicely represented at the Texas Relays held last weekend at the University of Texas in Austin. The multi-day meet produced 11 U.S.-leading and five CA-leading marks. Three Golden State individuals and two relay teams returned with event titles, two of the winning athletes are returning CIF State Meet champions. 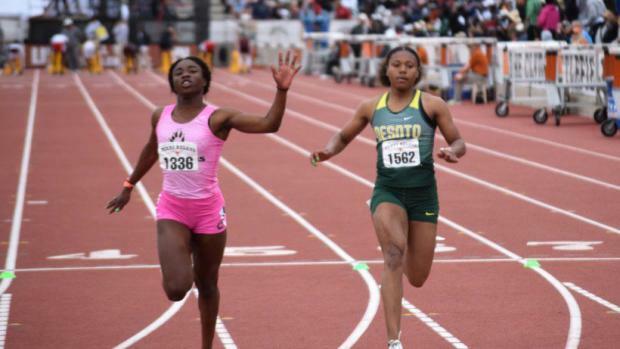 De'Anna Nowling (Calabasas/SS), Rachel Glenn (Long Beach Wilson/SS) and Jeff Duensing (Esperanza/SS) all returned to California as Texas Relays event champions. Nowling, the returning state 100 meter champion, won that event in Austin. The senior headed to the University of Miami won the Division II race in 11.43 (1.8 meters-per-second legal wind), the fastest of the two sections. Nowling previously ran 11.58 (2.7), the third-fastest time in qualifying. Glenn, also a defending state champion, won her signature event, the high jump, with a clearance of 5-8.50. Glenn tied for the state title in that event last June. Duensing, second in at the State Meet in the shot put last year as a sophomore, continued his improvement in that event with a winning throw of 65-3. This was just his second throw over 65 feet but not quite to his PR of 65-7.50 from the outdoor season opener. He also competed in the discus throw where he placed seventh with a best of 168-8 in an event won by Maurice Westmoreland, a junior from Klein Forest, who had a winning throw of 178-06. Duensing has had two throws over 174 this year and has a PR of 182-7 from winning the CIF-Southern Section Division 3 title last spring. The city of Long Beach had two winning relay teams in Texas. Long Beach Wilson's team of Seaver Cardoza, Collin Elingboe, Andrew Richards and Armando Bryson won the Sprint Medley Relay in 3:28.31 (CA No. 1). The Dana Hills team of Nicholas Kraushaar, Nathan Fatigate, John O'Melveny and Payton Kubalsky was ninth in 3:37.60. Long Beach Poly's team of Ronan McMahon-Staggs, Liam Anderson, Everett Steward and William Frankenfeld won the Distance Medley Relay in 10:22.61 to beat runner-up Dana Hills (Simon Fuller, Fatigate, Carrick Denker, Cole Stark) 10:26.91. <="" div="">Poly's boys placed second to DeSoto in the 4x400 Relay. The teams competed in Division II, the fastest of the two sections where DeSoto, posted a U.S.-leading time of 3:12.90. Poly's team of Octavion Hall, DeAngelo Chester, Kenyon Reed and Steward finished in 3:17.35. Long Beach Wilson, which had the No. 3 time in prelims (3:18.66) placed sixth in the final. The Wilson team of Cardoza, Bryson, Richards and Phillip Jefferson clocked 3:20.81. Nowling wasn't the only member of the Calabasas traveling party to leave Texas with something to talk about. Sophomore Bella Witt placed fourth in the 100 hurdles, running 13.92 (1.7) in a race won by Alia Armstrong, a senior from St. Katharine Drexel in 13.36. Witt had run 13.78 for the third-fastest time in prelims, a race that was aided by a 4.8 meters-per-second wind. Both times place Witt No.2 in the state for legal and all-conditions rankings. Calabasas senior Kyla Robinson-Hubbard placed third in the 300 hurdles, running 42.36 in a race won by DeSoto sophomore Jalaysiya Smith in 42.14. The time for Robinson-Hubbard, who placed second at the State Meet last season, ranks CA No. 2. Calabasas sophomore Jade McDonald placed fourth in the triple jump (39-3.25) and sixth in the long jump (18-9.25 (1.7). McDonald also joined Witt, Robinson-Hubbard and Nowling on the 4x100 Relay team that placed second in 46.46 to DeSoto (45.69). Calabasas ran a CA-leading 46.28 in prelims. 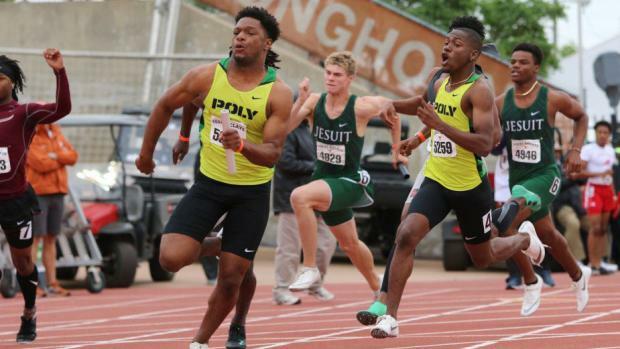 (DeSoto ran 45.07 in prelims!). Long Beach Poly's team of Queen Okoh, Saundria Martin, Jaelyn Predium, Zhanae Woods ran 47.02 in for fifth in qualifying but was listed DNS in the final. One other individual to mention before we conclude with other relay teams, is Westlake sophomore Paige Sommers, who cleared 13-feet in the pole vault for sixth place in an event won by Gennifer Hirata, a senior from Stafford, with a U.S.-leading clearance of 14-00. Sommers, the co-state leader at 13-4, has now cleared at least 13-0 in four meets this season with a PR of 13-4 in a March 12 dual with Calabasas. That mark ranks tied for No. 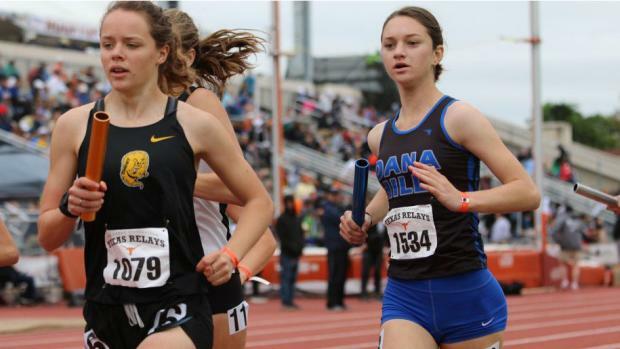 5 U.S.
Dana Hills' girls relays left their mark in Texas. In the girls 4x400 Relay (won by DeSoto in a U.S.-leading time of 3:39.81) the Dana Hills team of Mia Lawrence, Camryn Toole, Hailey Ray, Anisa Rind ran 3:54.38 for fourth (the Dolphins ran 3:53.75 for 6th in prelims). The Long Beach Wilson team of Maya Bryson, Dionna Griffith, Tyler Nettles, Rachel Glenn ran 3:56.00 for fifth (the Bruins ran 3:53.14 for 4th in prelims). The Dolphins; 4x800 team of Lawrence, Toole, Rind and Tess Mathes ran a CA-leading 9:21.55 for fourth place in an event won by DeSoto in a U.S.-best 9:14.70. Dana Hills' time ranks U.S. No. 6. San Diego's Scripps Ranch was a close second in the Sprint Medley Relay behind The Woodlands, which crossed in 4:00.12. The Scripps Ranch team of Jaymie Ruskovich, Aaliyah McCormick, Brianna Anders and Julia Morales crossed in 4:00.40. The Dana Hills quartet of Ray, Leah Boskovich, Rind and Mathes placed fourth in 4:02.55. Inserted photo above by Stuart Kantor.